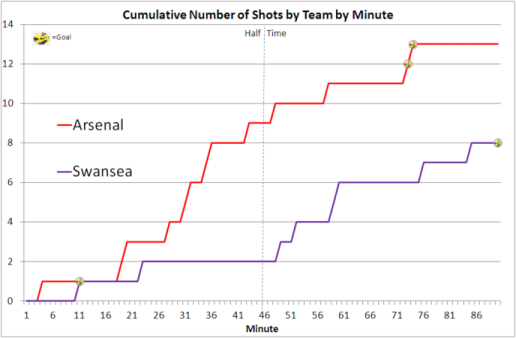 It's difficult to know what to make of that game: Being in front for over an hour, conceding two goals in 60 seconds, an equaliser with Leon in the box and a final few minutes where Arsenal seemed to have given up (or at least given up defending). 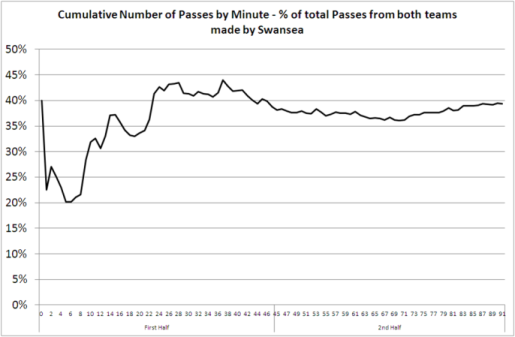 With only 40% possession, this was the lowest % of the ball Swansea have had in the league this season by some distance, but this will in part be due to Bony's early goal meaning there a greater incentive to be more defensive although there were plenty of misplaced passes too (although to some extent that's kind of a vicious circle as if you're defending deep and under pressure it's much harder to find an out ball so possession gets given up and the process repeats). 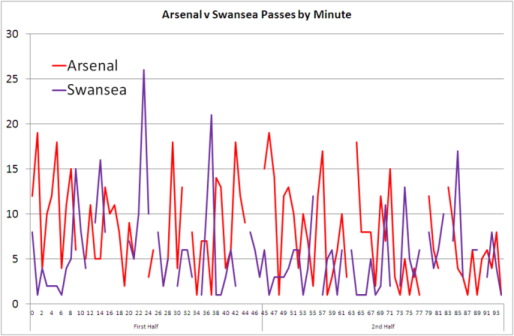 Despite dominating the ball, there were only occasional moments of incision from Arsenal prior to the two goals and although there was the odd case of riding our luck with defensive scrambles, Vorm only made two saves all match. After going ahead against Palace and drawing late on, then going ahead and losing late on against West Brom, to have the lead for over an hour and then seemingly throwing it away so quickly here would have had a massive impact on confidence going in to the Norwich game. Thankfully Arsenal's meekness combined with Leon's determination meant that instead we left with a point and everyone on a high. It could have of course been even better, I was amazed after the equaliser how Arsenal's defence seem to disappear, I understand that they needed the three points but they were leaving such big holes at the back that instead of penning us in and making us sweat like they had done for most of the match, they invited the counter attack and there were a couple of opportunities even before the one at the end for De Guzman. It was good to see the return of Michu to the starting line-up, taking him off after an hour was absolutely the right thing to do as he's still coming back to full fitness and Norwich on Saturday is crucial, but I was impressed that Monk was willing to do this as I'd argue Laudrup overplayed Michu when he came back initially from injury (90 minutes on his return v Hull and then another start 6 days later against Norwich after which he was out for 3 months). Playing De Guzman on the left hand side was also an interesting call, I'm not sure if it worked or not as the early goal changed the dynamic of the match. 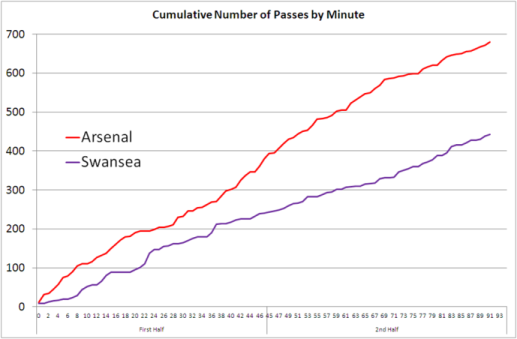 Below are a few other charts of some stats on the game, be interested in any thoughts on which are of interest and which a just too much information.